Over the past 40 years, research has clearly shown that retinol has numerous amazing benefits for skin, including anti-ageing and skin-refining abilities, plus visibly improving loss of firmness. Perhaps no other skin care ingredient has as much scientific data or unanimous dermatologist approval. Simply put, retinol is a superstar ingredient for all skin types and multiple skin concerns. Retinol is another name for vitamin A. This ingredient has the unique ability to help skin appear younger like no other ingredient can. That alone has tremendous impact for improving skin, but it gets better! Retinol is also a potent antioxidant and can interrupt environmental attack on the skin. Moreover, it can renew and help maintain skin’s layers to promote a healthy, radiant, youthful glow. Perhaps the most fascinating aspect of retinol is that it helps to renew skin in ways you never thought possible, which is why we consider it a must-have ingredient. That’s why Paula’s Choice offers many options to include retinol in your skin care routine. 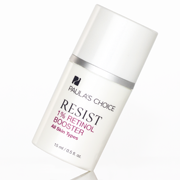 One of our favourites is Paula’s Choice 1% Retinol Booster, which just may be the solution your skin’s been waiting for! Paula's Choice Skincare's 1% Retinol Booster is a multi-tasking specialist that can be added to any skin care routine to give your skin the remarkable benefits of retinol. This lightweight, water-based fluid gives your skin a pure measure of fresh retinol every time you apply it. The result? Rejuvenated skin and a noticeable reduction in the most stubborn signs of ageing all of us would rather not see in the mirror. Our 1% Retinol Booster was specifically formulated to penetrate faster yet still be gentle, and it’s easily layered with the other essential steps in your skin care routine, such as serum and moisturiser. The best part about the 1% Retinol Booster is that it allows you to customise your skin care routine to target your specific concerns. Use it either every day or a few times per week, based on how your skin responds and which frequency of application gives you optimal results. As exciting as retinol is, at Paula’s Choice we know that one ingredient is never enough, no matter how remarkable it can be for skin. Skin is a complicated organ and requires more than one great ingredient for best results. That’s why we also included a potent mix of antioxidants and peptides to defend skin from environmental damage and help skin regain a smoother, softer, more even appearance. Is the 1% Retinol Booster Right for You? If you’ve been on the hunt for the right anti-ageing product to target fine lines, wrinkles, sun damage, congested and visibly enlarged pores, uneven skin tone and dullness, the 1% Retinol Booster is the answer. Really, multiple skin types and concerns can benefit from this booster, which makes it so exciting! Without having to change a single step of your current skin care routine, you can add this specialised solution to help rejuvenate and restore your skin in combination with your other skin care products. Our 1% Retinol Booster works for any skin type, though its ultra-light texture is especially suited for those with normal to oily or combination skin that may be prone to bumps and clogs. The easy-to-use pump allows you to control the potency of each application by letting you easily adjust the amount you apply. You can use this booster a few times per week, once or twice per day: At night, you would apply it before your serum and moisturiser; during the day, apply before your sunscreen. Consult your health care provider if you’re using topical products obtained by a medical professional or products from a dermatologist to ensure the 1% Retinol Booster is right for you. There you have it! Our 1% Retinol Booster may be the easiest way to easily take your anti-ageing routine to a whole new level — without having to change any of the products you’re already using. Check out the FAQ section of the 1% Retinol Booster product page or contact our team of experts.